Stop by the Poetry Bench for a rest, cool off or to drop off a poem in the drop box. The bench is located in Balboa Park, on the northeast corner of Sixth Ave. & Quince St. under a towering grove of magnolia trees. Clay plaster workshop for women. Come play in the mud and help re-plaster our beloved poetry bench that was built by 20 women in 2006. 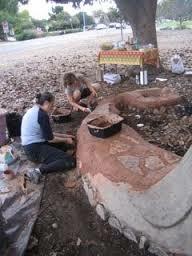 The bench will be included in the Balboa Park Centennial Celebration with events related to earth building and poetry. Come share your ideas. Location: Sixth Ave & Quince Street. Fee: $35. donation goes toward materials and centennial program.